Rip Strip LED cable comes in 500' and 1,000' reels. 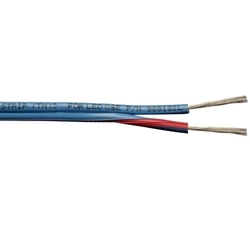 2 Conductor, 18 AWG stranded tinned copper conductor insulated with a Blue Polyvinyl Chloride jacket overall. UL Listed for sunlight resistant applications 105°C. Use 558 connectors to make LED connections to this wire. Alternative to the PLTC cable. Use 560 connectors to make LED connections to this wire.